Good Of Omega - Psi Phi Chapter of Omega Psi Phi Fraternity, Inc. 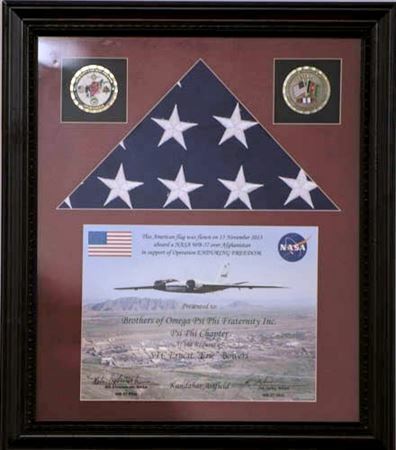 The flag was flown on a NASA Military Intelligence Mission over Afganistan. The mission located a 500 lb bomb that could have taken away many lives. With the commanders approval and supporting document and signature to make it official, the flag was presented to Bro. Bowers who presented it to Psi Phi Chapter for supporting his career. See attached letter.